Thrifty and Frugal Living: Alice in Wonderland Has Arrived! Alice in Wonderland Has Arrived! The day has finally arrived! 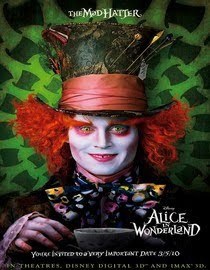 Alice in Wonderland is officially in theaters. So, running on 3 hours of sleep, my husband and myself are staying up late to go watch it. We are really 10 year olds at heart. : ) Needless to say, there probably won't be any other posts today (I do have 35 minutes til it starts...we will see). I hope everyone has a wonderful day and if I am not to exhausted from my 2 nights of sleeping 3 hours and working 10+ hours, then I will see you tomorrow! In the meantime enter some giveaways on my right sidebar. I can't wait to see this movie! I love that Johnny Depp takes such an eclectic range of roles. following you from tag, your it! Hi, found your great blog through Friday Follow. Now following! Good Saturday Morning, from a late Friday Follower! I'll be stopping by to see how the movie was, I really want to see it too! Hi, I'm following from FF. Not surprised you got a beautiful blogger award multiple times - this is a pretty beautiful blog! Hope you enjoyed the movie! A day late, but now following you! Happy Follow Friday! Aww...Thanks Ladies! I will be following you all back in the next day or two when I am off work!